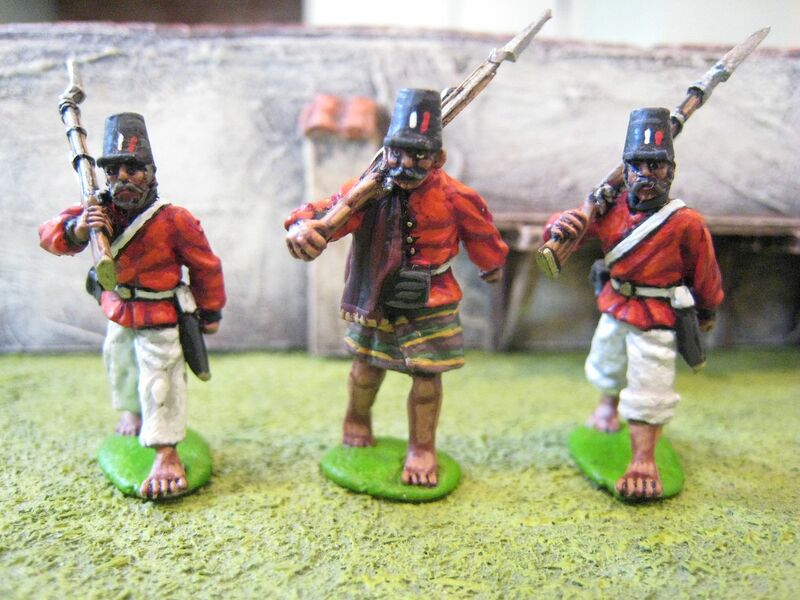 Nothing else to say on these, so perhaps a brief run-down on what's currently on the painting desk: final AWI highlander figures for Bill Nevins (I'll post some more pics of the 42nd Foot in a day or two); AWI northern militia; AWI southern militia; 3rd Chasseurs of the Guard for 1815; more Great Paraguayan War; ACW Bull Run Virginians; the Irish Legion of 1819 (another wave to the Legatus!). I'm waiting for various figures to be released and/or purchased before all those units will be completed, but this list makes 7 units on the go at once. I've also just received a parcel from Messrs Perry containing lots of AWI goodies, which should keep me going until Christmas. 2 figures. Painted August 2013. Some more AWI at last! On Wednesday I took a day off work and met up with "Eclaireur" and "Supercilius Maximus" (aka "Ronan the Librarian") at the former's north London pad to have a go at Stono Ferry. 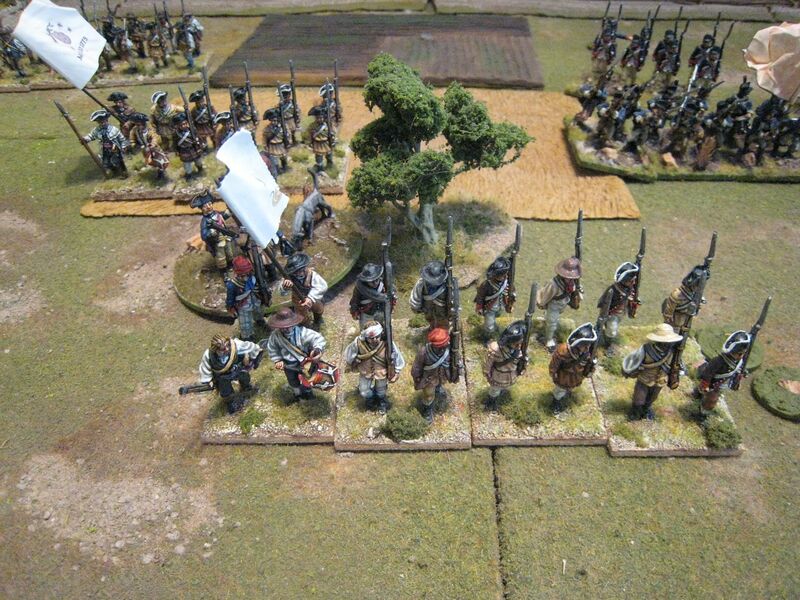 I brought along an American militia brigade, the 71st Foot and a couple of bits and bobs and the rest of the figures used were from EC's own collection. The table was dressed with EC's sumptious Realistic Modelling terrain and some nifty home-made abatis (fashioned from those diy plastic model trees that you add clumps of foliage to) and redoubts made using Renedra gabions. 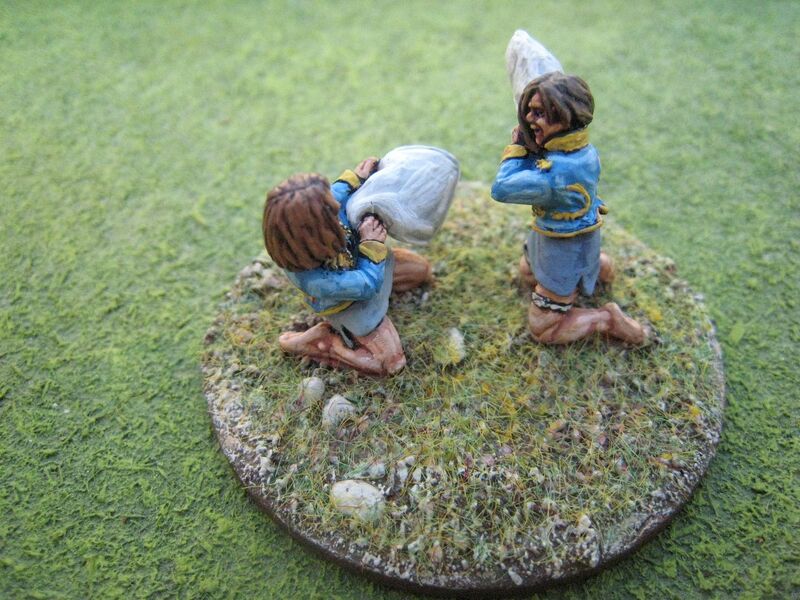 For rules we of course used EC's own "British Grenadier!". Stono Ferry is not one of the AWI "biggies" and probably isn't that well known a battle. 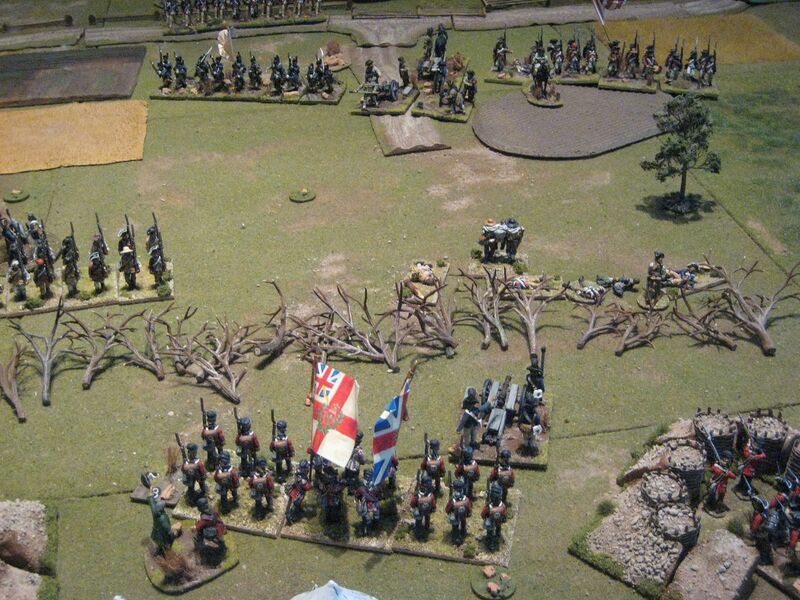 It's one of those rare engagements that involves an American attack on a British defensive position. After his attempt to invest Charleston in April 1779, Brigadier General Augustine Prévost decided to withdraw his British force back to its base at Savannah. Stono Ferry was a crossing point at which the British built a supply camp. A small force under the command of Lieutenant Colonel John Maitland of the 71st Foot was tasked with guarding the ferry. Brigadier General Benjamin Lincoln, commanding the American Southern Army, saw an opportunity to attack the British position. Here's the British camp. 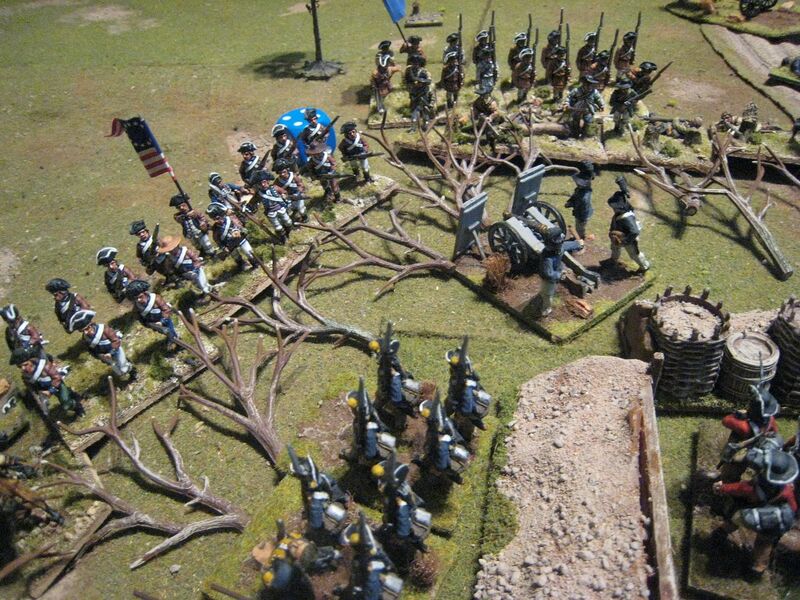 The forces (at 1:10) consisted of: the 2nd battalion of the 71st Foot (24 figures); Hessian Regiment von Trumbach (24); South Carolina loyalists (24); one 6-pounder and two 3-pounders. 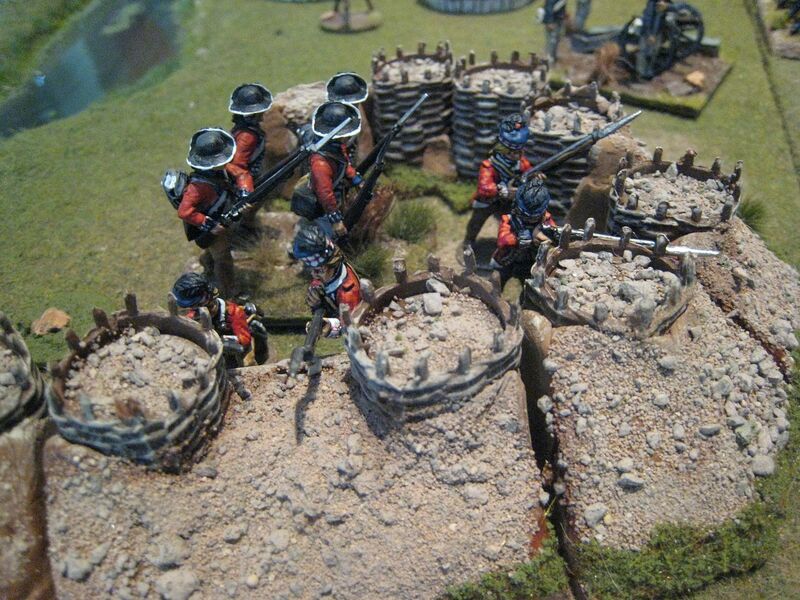 Protecting the camp are 3 redoubts, each of which has to contain 4 figures from the loyalist militia unit. So with those reductions the British player basically has two decent-sized infantry units, one of which is graded "elite" (the 71st) and 3 pieces of artillery. The 8-figure loyalist unit that remained after 3 bases had been detached for service in the redoubts didn't have much impact given its size. "Not much of a command for you", as Michael Caine said to Stanley Baker at Rourke's Drift, and clearly defending the entire perimeter would be difficult. I had brought along the 4 figures from the King's Mountain Miniatures highlander range that I painted last year and these wee put in the redoubt on the right flank. I don't think they were part of the official orbat, but we counted them for firing purposes. The American forces greatly outnumber the British ones. 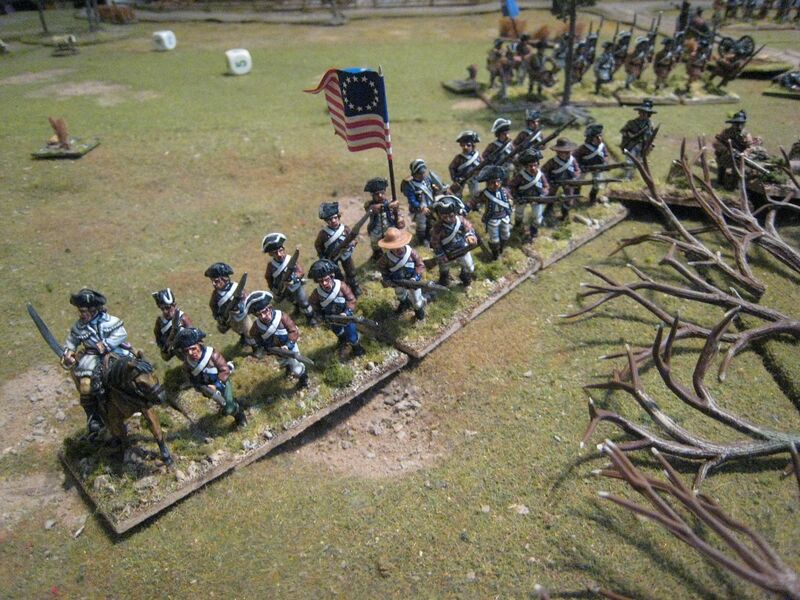 The American player has: two 12-figure skirmish units; four Continental infantry battalions (24 figures each); one Continental light infantry battalion (18); five militia battalions (of 16 and 18 figures); some militia cavalry and four guns. 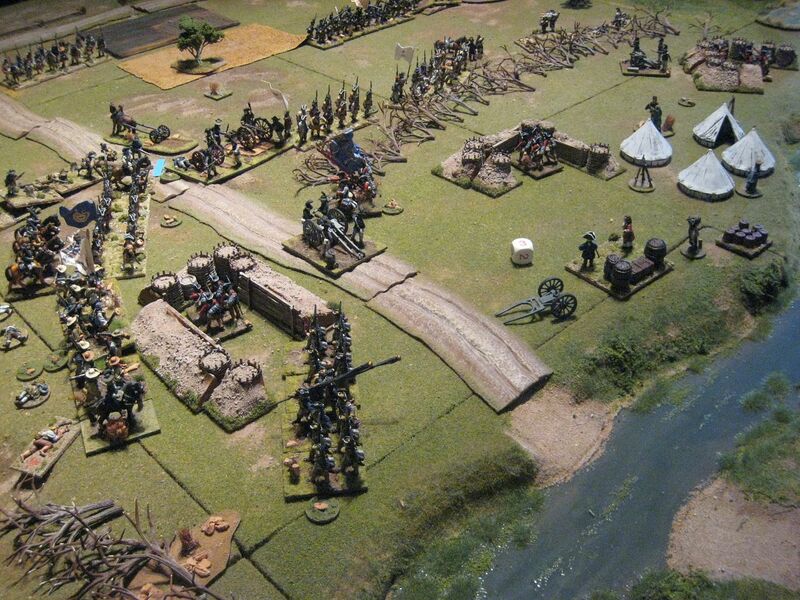 That's three whole brigades, although the frontage of the British camp is such that the American player cannot bring everything to bear at once. Ronan took the American side and I took the British, while EC umpired and generally threw in suggestions. 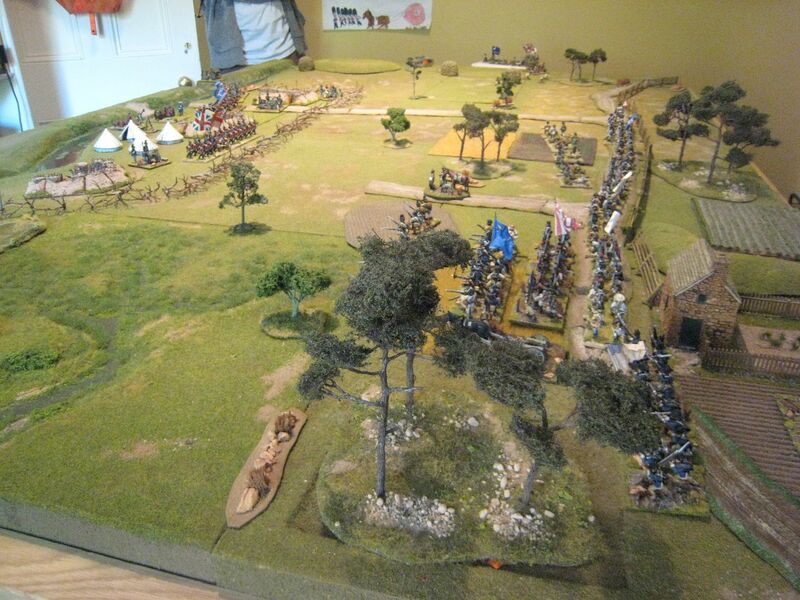 The first three or so turns involved the Americans advancing into position. 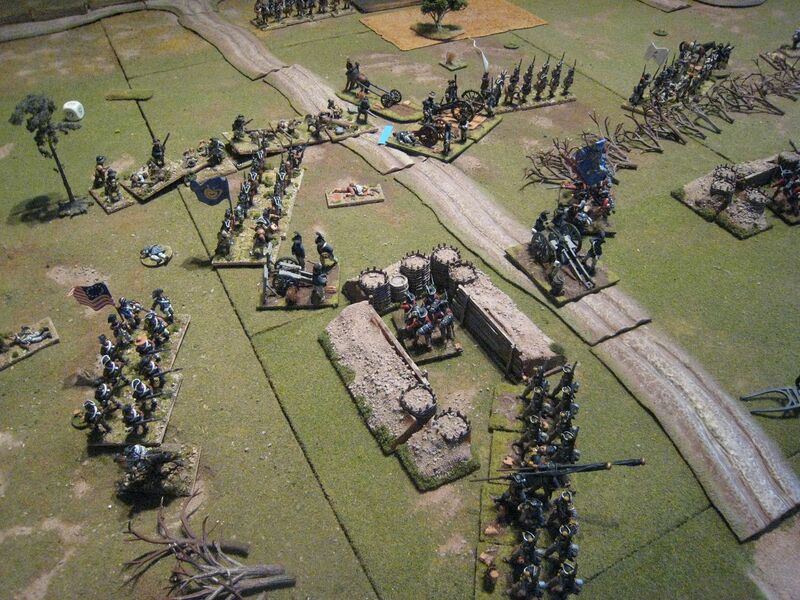 On the American left the leading light infantry unit became bogged down in swampy terrain, but otherwise the units advanced steadily and Ronan began to move his militia brigade around to his right to attack the left flank of the British position. However, the Hessians came under increasing pressure when the skirmishing riflement to their right broke through the abatis. The rule we used was that a unit had to remain at the abatis for one turn, representing work cutting through all the branches, and then took one DP (disruption point) going through it. 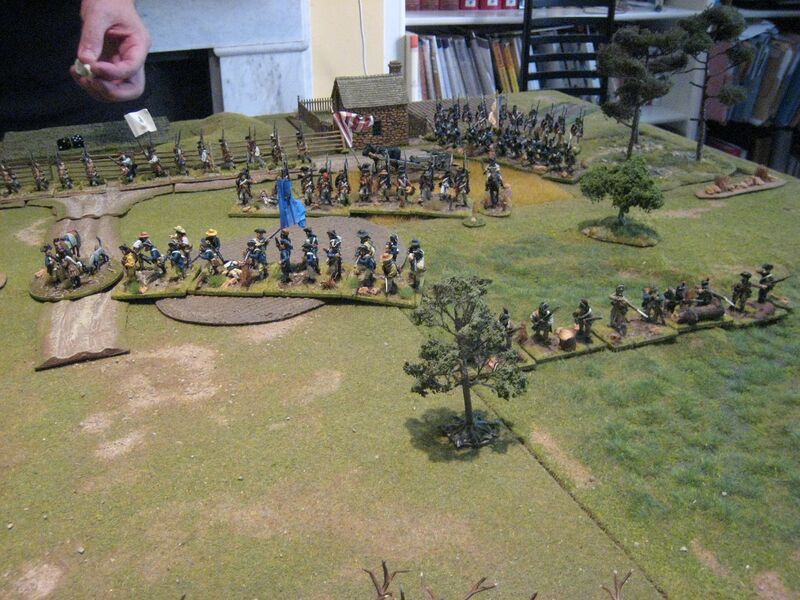 The British guns were firing canister at close range by this time, but I began rolling low scores and this swung things in favour of the Americans on the left. Eventually, depiste taking casualties, the American light infantry broke through the abatis and overan the British 3-pounder battery at the corner of the position as more American militia approached the Hessian right. 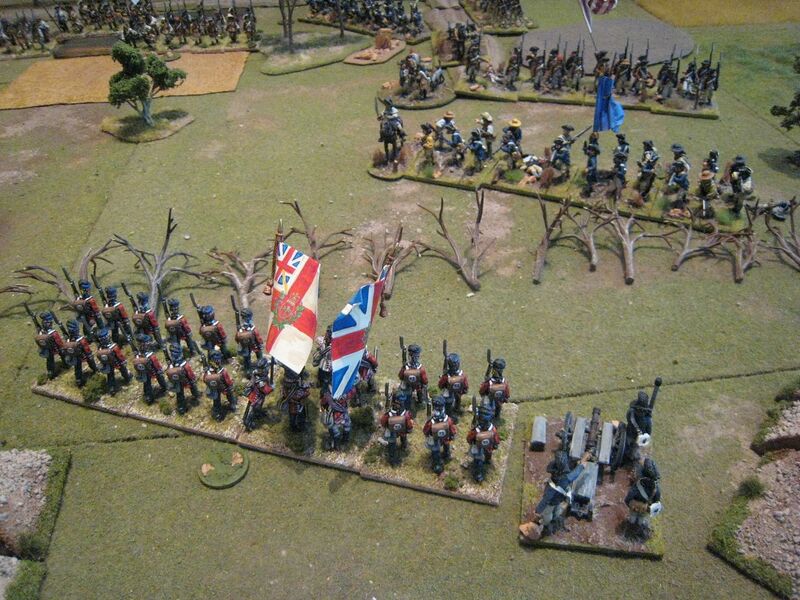 Over on the British right, the 71st were now taking enfilade file from the guns that the Americans had brought up in support of their attack. 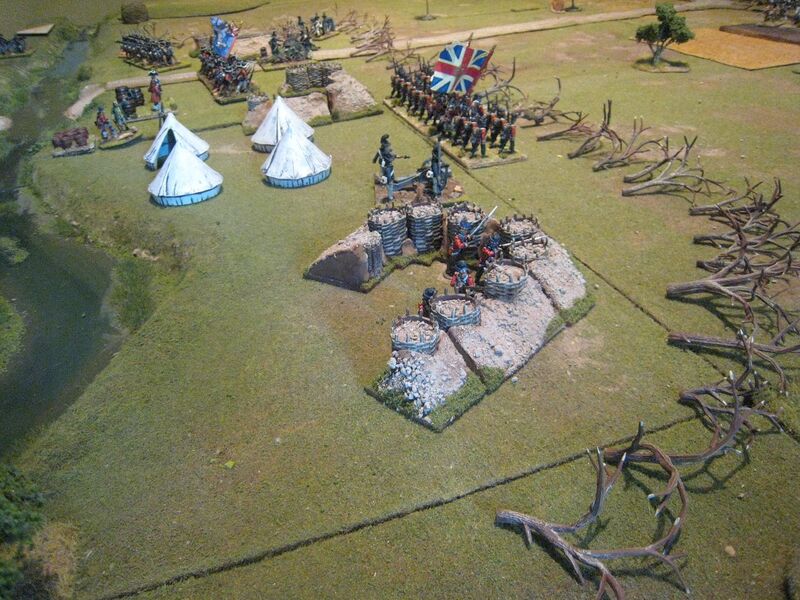 The highlanders started taking heavy casualties and I realised that instead of a defence line I now had isolated pockets of troops that would not be able to deal with all the Americans now reaching the British camp. As time was running out we accelrated the arrival of the third American brigade, which assaulted the redoubt in which the Hessians had now sought refuge. 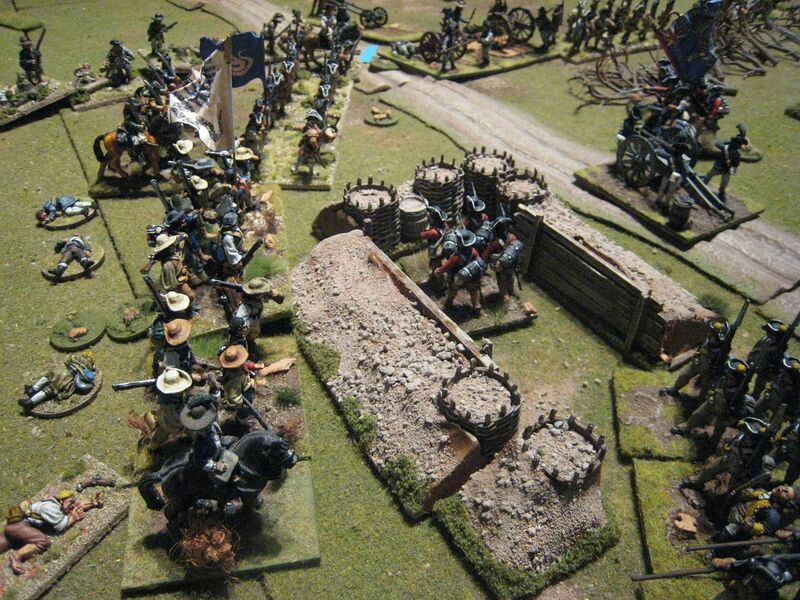 Behind them, the 71st finally failed a morale throw and it was all over for Maitland. This was a game where fortune seemed to ebb and flow very quickly. 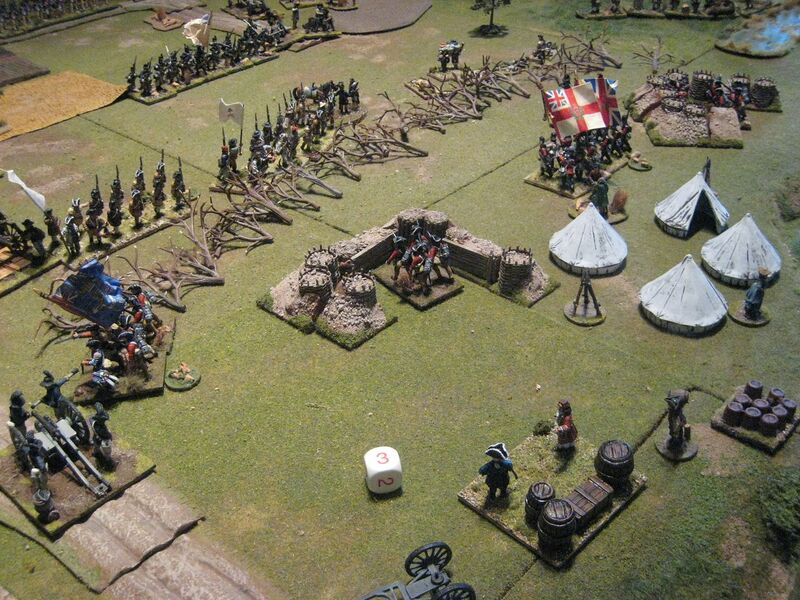 When the Continental brigade retreated I thought "let's now do the same on the other side of the camp" but the dice failed me and the position was reversed. Winning the initiative and so having the ability to fire first was crucial for the British player, and I lost that too in the later stages. 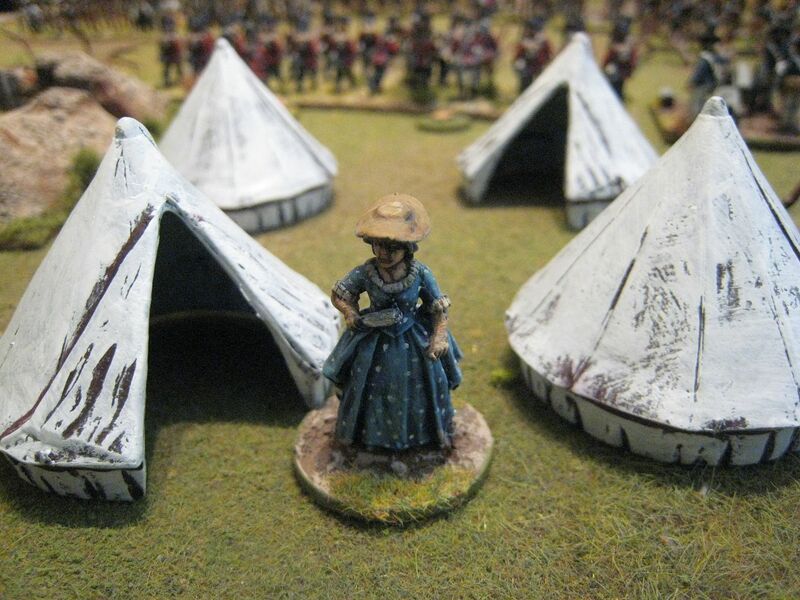 Another problem for the British is being able to move inside the camp. What I probably should have done was to play a fighting retreat back away from the abatis and keep the units together, instead of allowing troops to get cut off. The American player needs to control his dispositions carefully, as otherwise units are left in the middle of the table with nothing to do. Getting into shooting contests is also unhelpful for the American player - I suspect the best thing is to get over the abatis as quickly as possible and try to overwhelm the British. Of course if charges fail to go in, as happened with the Continentals, one is left stuck in a firefight. We had thought that this game might be over very quickly, but in fact it kept going for about 10 turns and we weren't quite finished at the end. It's a neat little scenario. 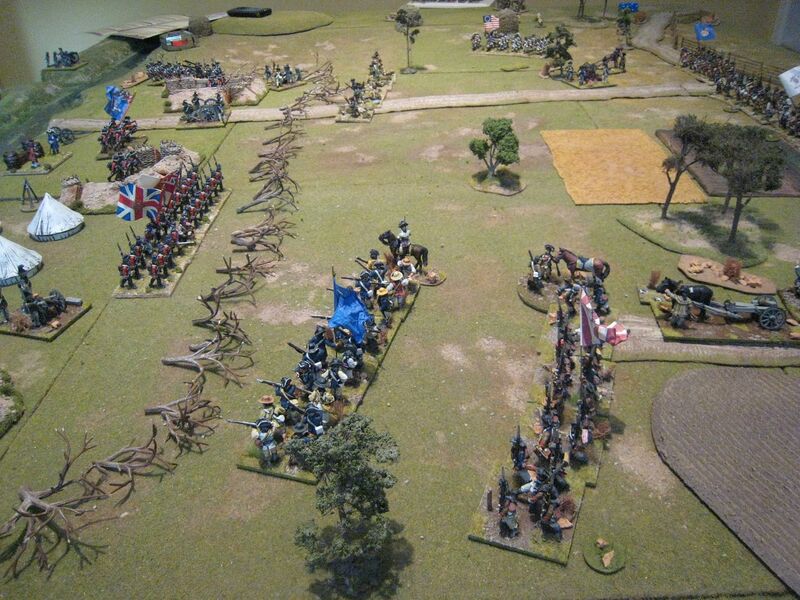 You get the chance to have a British camp and lots of Southern militia types on the table and the American player has rather more thinking to do than in several other better-known battles. I painted my 71st years ago using Perry marching figures, but I'll have to paint another battalion's worth using the King's Mountain Miniatures firing pose figures. Here are 3 test figures from a new range in respect of a war that I hadn't even heard of until I saw the figures advertised. Anyone like to hazard a guess as to the period? You guys are way too clever - correct answer in the very first resposne! 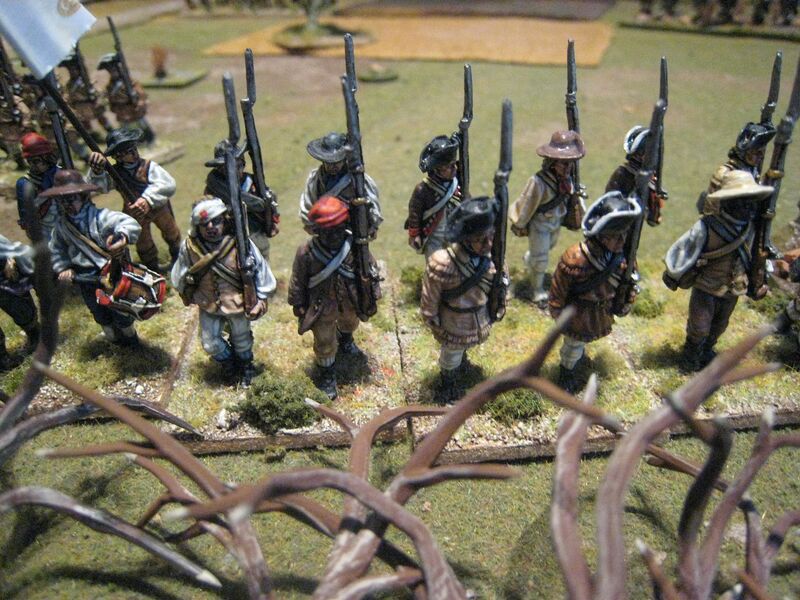 Yes, these figures are for the Paraguayan War, aka the War of the Triple Alliance, which was fought from 1864 to 1870. I've just finished reading a short synopsis of the war and it sounds a pretty horrid affair. It was a diasaster for Paraguay as some 40% of its population died (including a large number of civilians who died from disease imported by its enemies' armies). The destruction of Paraguay's male population resulted in its later armies consisting largely of children and old men. 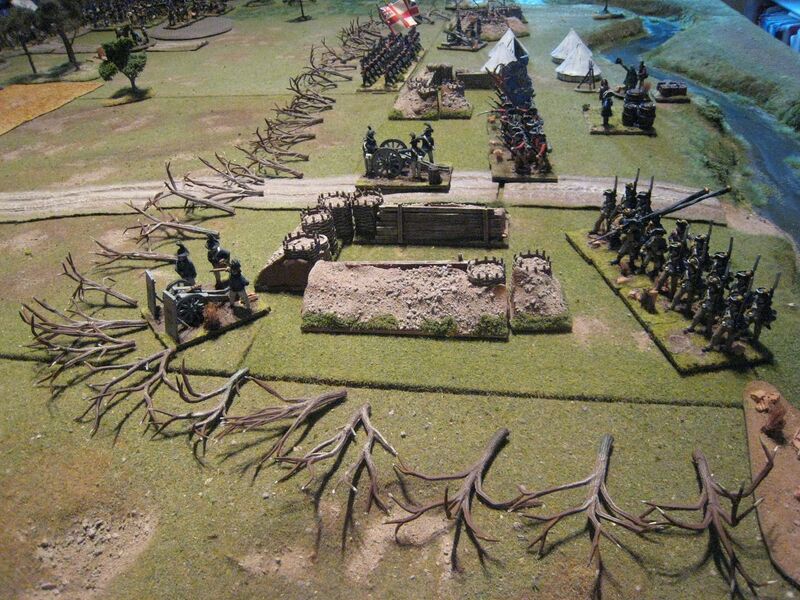 The battles appear to include a few stand-up fights but lots of sieges and assaults on entrenched positions. I'll have to do more reading to work out exactly what gaming opportunities are presented by this period, but it falls squarely within "my kind of thing": off beat period, nice figures, colourful uniforms (gaucho cavalry!). I wonder what the terrain would look like; I'll have to do some digging on that too. The figures are from a new company called Kingscarbine Miniatures. 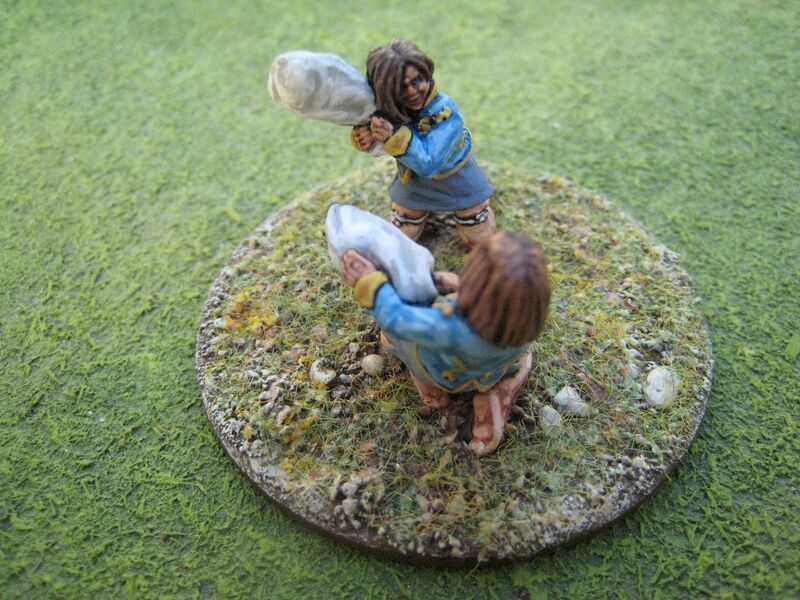 Nuno, the proprietor, is well known to First Carlist War gamers. He recently posted a proposed list of figures for this range on TMP - if the project continues this should be pretty comprehensive. I just hope that the project is viable - there have been lots of new ranges recently that produce a handful of packs and then go quiet. 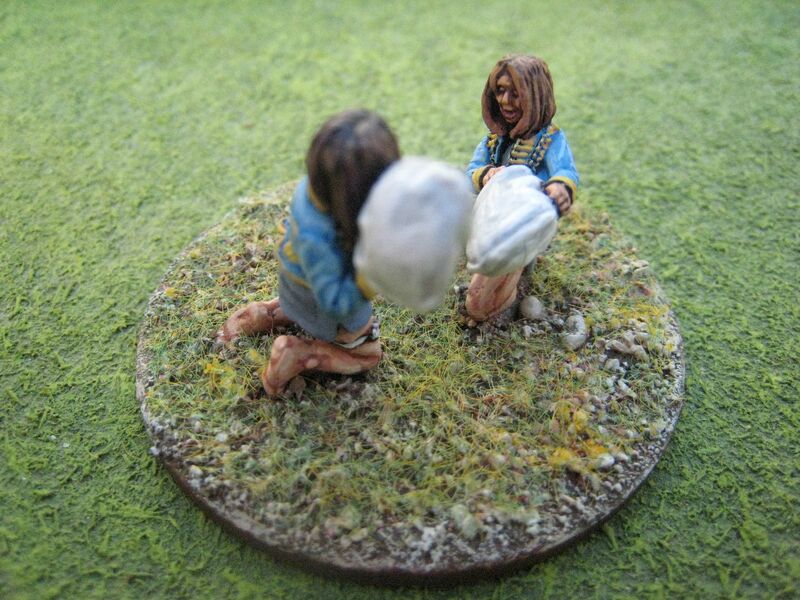 So whilst I have plenty on my painting plate at the moment (or should that be "palette"? ), I'm happy to give this project some support. I bought 1 each of the packs in the initial release and will aim to have those painted by the end of the month. I seem to be butterflying quite badly at the moment; not sure why.